I haven't had a spinning update in awhile because there really isn't anything new to report. I'm still working on my Pol-paca blend for weaving. Last update on that here. I have about five or six more skeins, but basically it's just more of the same. In turn, I'm going to tell you a story, and then show you how I measure and calculate handspun for projects. I will do that over a couple of posts, so let's just say that this one is the introduction. I had an experience when I first started spinning that has left me a tad paranoid ever since. I created my first 2-ply handspun (pictured on left) from two pounds of Brown Sheep mill end roving (aka "beast" roving.) My yarn was quite bulky and I was very pleased with it. Being the project person that I am, I decided I wanted to make a sweater with it. I chose the "Stone Circles" pattern from Sylvia Cosh's Crochet Sweater Book, and spent many happy hours working on it. Imagine my dismay when I ran out of yarn before I finished the sweater. But, being a rather determined sort, I recalculated and tried some modifications. No luck. Next I tried a different pattern. Same results so I tried again. Now, my husband will be the first one to tell you that if anyone can fit ten pounds of potatoes into a five pound bag, I can. Even so, I could not make that yarn stretch enough to get a sweater out of it. In the end, I chose a crochet vest pattern; one I found on a Lion Brand skein wrapper from a project long before I learned to spin. I added a reverse stitch crochet for the edging, and omitted the pockets. I've been happy with that vest ever since, and don't regret that it didn't become a sweater. I love to wear it over a denim jacket when the weather turns extra chilly. All's well that ends well, but I learned something valuable from that experience: that I need to calculate project needs before I ever get started. I admit that I'm still always a little nervous about this. With careful measuring and calculating, I usually end up with yarn leftover. So how much pol-paca yarn will I need to weave a coat? I'll start figuring that out next time. I'm glad that you ended up with something that you love! huh, I manage reasonably well with spinning for knitting by now - but weaving is another thing altogether:(( when I did the 2nd weaving, my silk scarf, I guessed that I had plenty. after putting on the warp I figured I didn't have enough - only to end up with nearly a ball of silk left, because I chose to narrow the warp down a bit:)) and a narrow scarf, too... well, I think it takes practise too and while I focus on getting better with the weaving, I don't want to calculate too much for amounts.... you have a lot of yarn to spin though, for a long and wide coat like that! happy spinning! I love hearing all about how your projects come about. I haven't made anything out of my hand spun yet, your vest looks great! 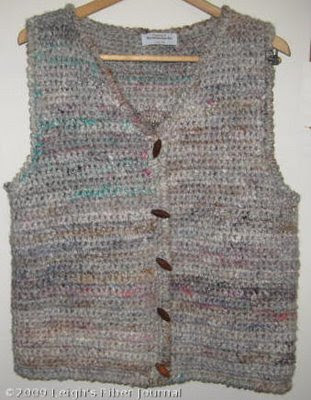 Such fun to see this crochet vest and the lessons learned. I always spin much more then I think I need and so far, so good. I know I've had the same sort of problem only with a shawl I was weaving. 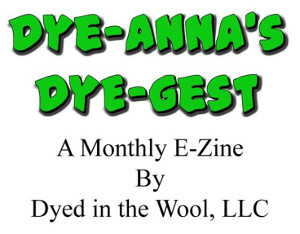 Your yarn is perfect for the lovely crocheted vest. I am horrible at calculations. They make me regret not paying attention during my math classes. I'm paying now. Reminds me of the old Texaco ads - pay me now or pay me later. I'm paying later. Oh- I'm so glad you are going to teach about this...I am an old dog, but need to learn a few new tricks. I'm pretty good at estimating (ha! about 50% of the time)...and I've got that spinners attitude (oh I'll just make more yarn) problem. Not to mention I'm a process person. It is time to change all that and learn how to do something if I really want to. I love that book of Sylvia Cosh's and stone circles is always one I had planned on doing -but never got round to it-however I did do her celtic jacket and still wear it.However I just spun and crocheted till it was finished.I never thought to measure my yarn.I see I have a lot to learn!